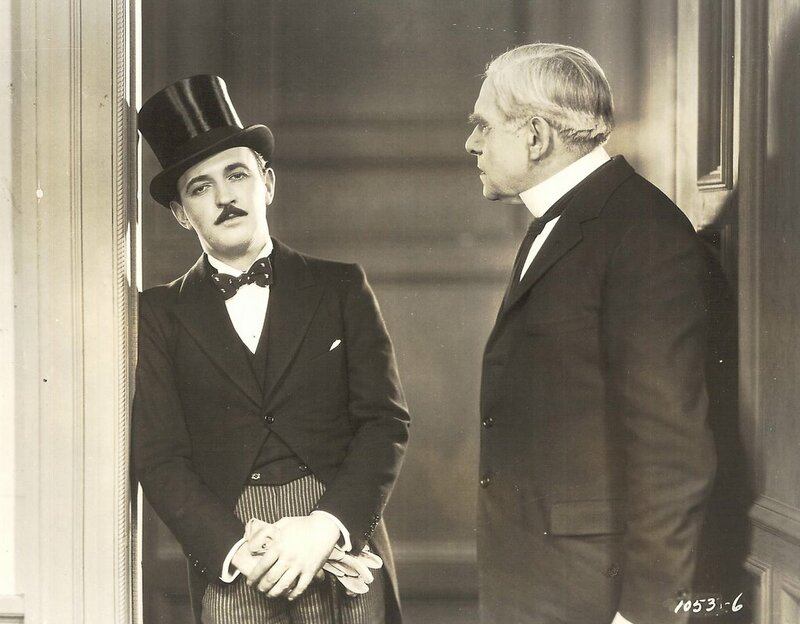 Raymond Griffith (born 1895) was one of those "Silk Hat" comedians during the silent era, sort of a William Powell of his day (in fact, he and Powell worked together at Paramount). The fact that Griffith is utterly forgotten now is due largely to the fact that most of his starring vehicles are lost. There’s a reviewer on imdb who claims to have seen some of these features, but his reviews look a little fishy to me. Maybe there’s more Griffith stuff out there than I thought. Anyway, I saw him in a 1924 pic called Changing Husbands at one of those long-ago Cinecon gatherings, and believe me, this guy raised the roof. You know how sometimes people will laugh at a silent comedy because they come expecting nothing, and it turns out to be a little better than they figured? Well, this thing simply laid them in the aisles. Griffith’s pantomime was an absolute revelation. He made Chaplin look he was playing Ibsen. I wish I could have another experience like that with a silent feature. 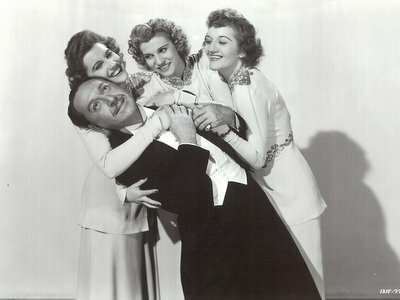 In fact, I wish I could see Changing Husbands again, maybe on DVD. Raymond Griffith never had a chance in talkies, because he’d lost his voice to childhood diphtheria (there’s also some screwy business about an on-stage trauma he suffered in a kid role, but I don’t buy it any more than those suspect imdb film reviews). One talker he did make was something called The Sleeping Porch, which I saw in an unannounced Syracuse Cinefest screening. It was a 1929 short, and they explained Griffith’s largely mute performance by establishing him as a man rendered speechless with a bad cold! Needless to say, this was not productive of laffs. Fortunately for Griffith, his producing acumen led to a longtime association with 20th Fox, where he’s credited with, among other things, The Mark Of Zorro (Bless you for that, Ray!). The real Raymond Griffith shocker is how the man died. Choked to death at his table during dinner at the Masquer’s Club in 1957! Dead at 62 of asphyxia. Ate something bad, they said. Great comedian, though. Check him out in another good one, Hands Up!, if you can find it. Franklin Pangborn (born 1888) was always a "nance" character --- more specifically a sissy, a fussbudget, a harassed clerk, or functionary. He worked behind a desk so often in his movies, I began to wonder if he even had a lower torso. Anytime Pangborn showed up in a feature, you knew the whole enterprise would be better off for it. Everybody had a good time watching Frank. He was always great. Bill Fields liked to use him, as did Preston Sturges. This is Frank with the Andrews Sisters in a little 1942 Universal musical called What’s Cookin’, and I guess there’s about as much a chance of the studio releasing this as there is of flying pigs colonizing Saturn. There is a new DVD of Paramount comedy shorts coming from Kino in February, however, and Glenn Erickson’s excellent REVIEW says Frank’s in one of them. Reason enough to buy, I’d say. 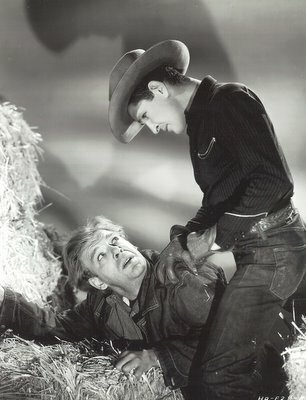 Bob Steele (born 1907) was a little whirlwind of a "B" western star who made his horse look like Winged Pegasus, but he could also be the nastiest "A" picture villain in the business, as witness Of Mice And Men (pictured here with Lon Chaney, Jr.), City For Conquest, and The Big Sleep (where he makes a sniveling Elisha Cook drink poison). 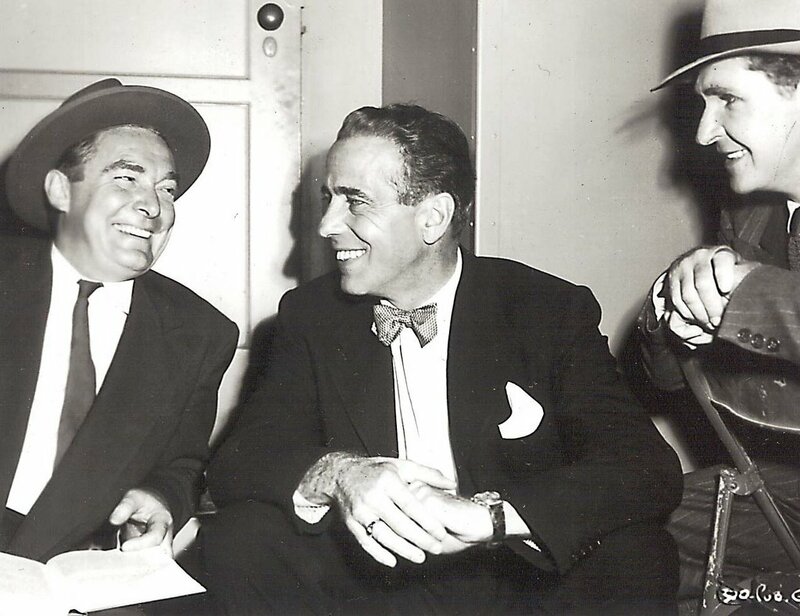 Bogart really liked Steele, and made a point of using him in 1951's The Enforcer --- here they are on the set with Roy Roberts. By the way, does anybody remember that time Bob did a 1970 Family Affair episode where irritating little Jody idolizes old-time cowboy star Bob, only to be disillusioned when Uncle Bill introduces him to the now aged and decrepit Steele? It was a nice vignette, and very nearly Bob’s last stand before a camera before emphysema laid him low. I recall some western fans telling me about a mid-eighties visit they’d made to the old timer where he could barely make the trip up the hallway to greet them. But he came, and they were thrilled. By all accounts, he was a good guy, and what a stunning go at fisticuffs he could stage! Yes - I thought he resembled Mr. Finnes when I saw his profile. By the way - when you mention new DVD sets that are forthcoming- any chance for a link to amazon or where you got the info (unless its inside info)? Some of these sets need to go on my "To purchase" list for the future. Thanks again for the great pix, etc. RE: Charlie McCarthy- I enjoy listening to Bergen and McCarthy radio show, and recently saw on TCM a movie that teamed them up with another radio favortite of mine, Fibber McGee and Molly. I can't rememeber the name (I'll check IMDB in a moment)- it was fun, expecially seeing Gildersleeve and Charlie teaming up for some mischief. Wonder if it's available on DVD? For my money, Bob Steele could never top his Trooper Duffy on F-Troop: "There we were at the Alamo. Me and Davy Crockett...shoulder to shoulder and backs to the wall!" Contrast this ongoing gag with his portrayal a few years later of the regretful and imprisoned member of the lynching gang in Hang 'em High, and it shows a lot of range in the great Bob Steele. The photos on your page are fantastic! I espectially love the shot of Steele with Bogart. As for Fiennes looking like like Steele, others have mention the actor being an ideal choice to play Bela Lugosi or Peter Cushing.